At approximately 6:15pm, on Wednesday, July 8, the answer was "No." Delegates of the 60th General Conference voted down the question, "Is it acceptable for division executive committees, as they may deem it appropriate in their territories, to make provision for the ordination of women to the gospel ministry?" The action by the General Conference Session delegates means that the Seventh-day Adventist Church will continue to follow the status quo as far as ordination is concerned. At present, it is the unions that approve ordinations. For most of the church’s history, women, not least Ellen White, have occupied leadership roles in Adventism. The question of formal ordination to Gospel ministry for women has been in play at the General Conference level at least since 1881. From the 1970s onward, the conversation has been intense, with General Conference discussion occurring several times, though always ending in refusal of equal opportunity and recognition for women. Today delegates to a General Conference Session reiterated that refusal. Ordination was the only topic of discussion on the day's schedule, spanning two business sessions from 9:30am to 4:30pm with a break for lunch. Retiring General Conference Vice President Mike Ryan chaired the session that was notable for its decorum. Ryan made a largely successful effort to assure fair and productive interaction among delegates on both sides of the question. Speakers on both sides (either way most were men) offered biblical arguments. In addition, those wanting a Yes vote appealed for support in recognition of the Holy Spirit’s call to, and the church’s need for, women pastors. Those wanting a No vote offered warnings about potential damage to church unity and argued that the whole conversation was a distraction from mission. Tension erupted following a passionate appeal by former General Conference President Jan Paulsen, targeted primarily at delegates from Africa and South America, urging a Yes vote on the question. Paulsen appealed to delegates to trust one another’s leadership with respect to the question of ordaining women. African delegates booed loudly when Paulsen referenced them specifically in his appeal, and several delegates rose to microphones to register complaints that he was allowed to speak to them in a direct way. Throughout the day, Chairman Ryan repeatedly asked the audience to refrain from applauding to preserve a spirit of respect for the diversity of views represented in the building. Nevertheless, the audience applauded at many junctures. Speakers on both sides (either way most were men) offered biblical arguments. In addition, those wanting a Yes vote appealed for support in recognition of the Holy Spirit’s call to, and the church’s need for, women pastors. Those wanting a No vote offered warnings about potential damage to church unity and argued that the whole conversation was a distraction from mission. Ryan called an end to discussion at 4:30pm, though there were large lines of delegates still at microphones. Delegates voted by secret ballot section by section, and then the votes were counted by hand with cameras rolling to provide transparency. After the votes were tabulated, Ryan told the room he had the results. He read the vote, and when applause broke out, his voice broke slightly as he once again chastised the audience for the display. Ryan repeated the results once more, and then President Wilson took the microphone to make concluding remarks. Wilson began with prayer, saying "We humble our hearts before you and each other. We ask that you will make our pathway clear." He prayed for "healing and comfort for each of us, and for the unity that comes through the power of the Holy Spirit." Then added his belief that the Holy Spirit had worked on the people's hearts. "We have a spiritual opportunity to refocus on mission," he said. Wilson appealed to the authority of the General Conference in session in a statement by Church founder Ellen White, and invited all to "put away any animosity and frustration and unite in the Lord's entrusted mission for his church." He asked that there be no independent action or agitation, signalling his intent to see the issue settled. The audience sang together the hymn "We Have This Hope," and the audience began filing out of the Alamodome. Jared Wright is Managing Editor of SpectrumMagazine.org. 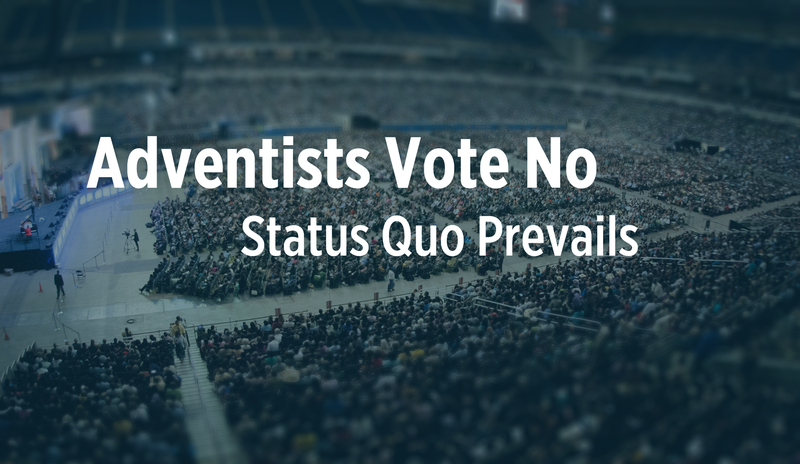 Adventist Forum Board Chair Charles Scriven contributed to this report.